Mental health nurse Sharon Morris was attacked by a patient in the grounds of her former workplace in North Wales last autumn. Ms Morris was repeatedly punched in the face until she lost consciousness and collapsed. A year on, Ms Morris says she continues to suffer after-effects from the incident. Ms Morris was so affected by her experience that she felt unable to return to work. After a three-month absence from nursing she had a fresh start, and now works in the community with a caseload free of patients with a violent history. Sadly, Ms Morris’s story is far from unique. There were 70,555 recorded assaults against NHS staff in England in 2015-16, a rise of 18% since 2011-12. Yet in the same time frame, the number of cases in which criminal sanctions were imposed fell from 1,380 to 1,250. On 20 October proposals for tougher laws against those who assault emergency workers in England and Wales were debated in parliament. Draft legislation proposed by Labour MP Chris Bryant, and backed by the government, calls for the maximum sentence for common assault to be doubled from six months to a year if committed against an emergency worker while on duty. But the proposed law would not extend to NHS staff such as mental health nurse Ms Morris, and would only cover staff working in emergency departments (EDs) or urgent treatment centres. Mr Bryant says the question of whether to extend the bill to include other NHS workers will be considered at committee stage, part of the parliamentary process before it becomes law. 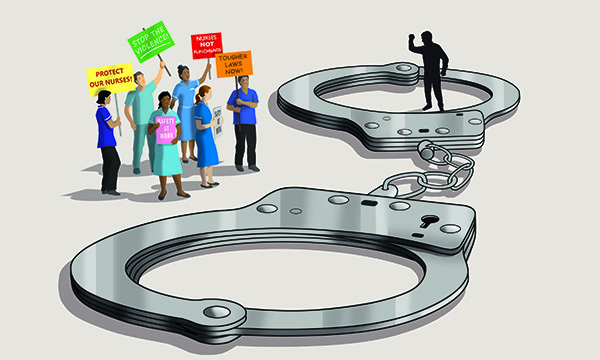 The Emergency Workers Act in Scotland, passed in 2005, provides for a penalty of up to 12 months imprisonment or a £10,000 fine, or both, for anyone convicted of assaulting NHS staff. In 2008, the law was extended to include community nurses, midwives and GPs. An NHS Scotland staff survey in 2015 saw a 10% reduction in the number of staff who said they had experienced a physical attack at work. A Scottish Government spokesperson says enforcing the extended law, and working with NHS boards, staff and trade union representatives, had helped to reduce attacks and improve workplace safety. ‘Attacks against our NHS staff are despicable and the perpetrators must be dealt with in the strongest possible terms. No one should be the victim of abuse or violence while at work,’ she says. RCN professional lead for emergency, acute and critical care Nichola Ashby says it is likely assaults are widely under reported. The college criticised a recent government decision to stop collecting data on assaults against NHS staff. Dr Ashby says abuse faced by nurses ranges from abusive language and name calling, which are very common, to violent acts such as stabbing. ‘I’ve been assaulted – most nurses have,’ she says. She says the proposed legislation needs to go further and extend across the entire NHS. ‘Assaults are not something purely seen within the emergency department,’ she says. Dr Ashby also says it is important to differentiate perpetrators of violence who may be affected by medical factors. Saskia Garner, a policy officer at the Suzy Lamplugh Trust, says NHS staff must be supported by managers to report and record instances of violence. Suzy Lamplugh, an estate agent, went missing in 1986 after going to meet a client in London. She was never seen again and was declared dead, presumed murdered, in 1993. The charity bearing her name now provides personal safety training to the NHS and other organisations such as councils, property developers and probation services. Ms Garner says: ‘So many health workers are so committed to their jobs, that there is a sense of “this is unavoidable”. Use a buddy/tracing system so colleagues know where you are and how to locate and contact you at all times. Consider carrying a personal alarm and lone worker device or ensure access to a panic button if you need to call for urgent assistance either covertly or otherwise. Follow any employer policies/procedures regarding personal safety and lone working. Use de-escalation and diffusion techniques to remove yourself from unsafe situations and alert your employer as soon as possible. Report any incidents to employers to ensure a record is kept so as to alert other colleagues to future risks. Security staff at Guy’s and St Thomas’ NHS Foundation Trust in London were given body cameras in September 2016 for a six-month trial after a rise in attacks on nurses, other front-line workers and patients. In the previous six months there had been 850 recorded incidents, compared with 620 in the same period the previous year. The trial was part of the trust’s Keep Our Staff Safe campaign, backed by the Metropolitan Police, to reduce violent and abusive behaviour by patients and visitors and increase staff awareness of the support available to them. Guy’s and St Thomas’s chief nurse Dame Eileen Sills says data showing the effectiveness of the campaign will be available in the next 12 months, but the trust is considering rolling out the body cameras to all security staff. Dame Eileen says: ‘It’s difficult to know the exact impact, as the reported level of violence and aggression increased – people were positively reporting more incidents than before. ‘Community staff were more compliant with their lone worker devices and had some successful prosecutions and it appeared they felt more able to say, "it's not okay". ‘It’s early days, but there has been a culture change in the workforce – it is okay not to accept it, and it is not part of the job. Dame Eileen explains it wasn’t just the level of aggression that had increased, but also the extreme nature of the violence. Staff were given tips on de-escalation, and the public was asked to help keep staff safe with posters to raise awareness about the violence. Dame Eileen says it is a fallacy to think that violence only happens in emergency departments, and believes it is important to lobby to raise awareness of this among politicians and the public. ‘Cases of violence and aggression happen anywhere in the hospital – in the grounds, in our coffee areas, in maternity, on the wards.